Home Is it “parental alienation”? Many parents in high-conflict post-divorce situations find themselves wondering if the other parent is “alienating” their child from them. 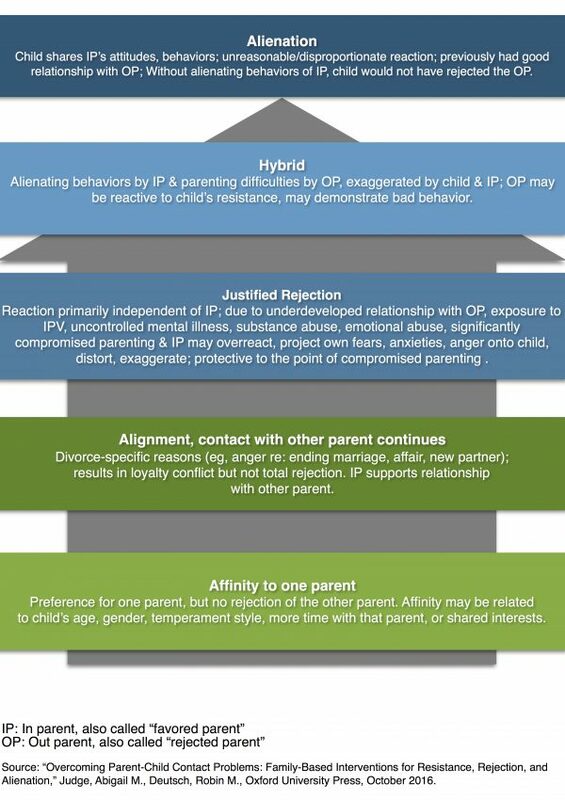 Sometimes there are actions on the side of the “in” or “favored” parent that are encouraging an unhealthy alliance between that parent and the child or children. Sometimes there are actions on the side of the “out” or “targeted” parent that justify a child’s resistance to seeing that parent. No two of these situations are alike, and it takes a trained and experienced therapist to assess whether there is actual parental alienation occurring. This diagram illustrates the continuum of what are called “parent-child contact problems,” and may help you identify what your family is experiencing.